Minnetonka and Duluth East each sit hard alongside a major lake. Other than that (and admittedly the lake thing is a stretch), there aren’t a lot of obvious ties between the respective hockey programs. And by obvious, we mean a lengthy history of state tournament showdowns such as the one shared by Duluth East and Edina (six state semifinal meetings since 1995). Duluth East and Minnetonka have met once in a state tournament, in the 1994 quarterfinals. The Greyhounds won 3-1. And that’s about it for big-stage showdowns, unless you count the 2012 Hockey Day Minnesota matchup in which the regionally televised game was moved indoors to the Pagel Activities Center from the planned outdoor setting alongside Lake Minnetonka. The Skippers won that one 9-3. Duluth East dropped Edina from its regular season schedule about 12 years ago. 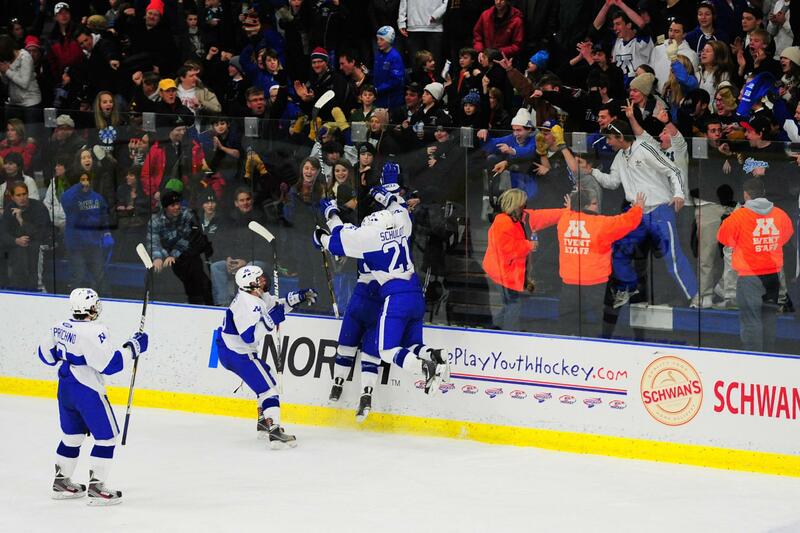 At about that same time, Minnetonka became a regular opponent. The teams have met 13 times in the regular season since 2006 (including twice in Schwan Cup Gold Division tournament games). Duluth East has a 7-5-1 edge in that span, including this season’s 4-2 triumph on Jan. 6 at Pagel. Duluth East led 3-1 going into the third period, and although Minnetonka pulled within one 2:44 into the third on a Luke Loheit goal, it never seemed like the Greyhounds were in peril. Nick Lanigan’s empty net goal with 1:29 left clinched the victory, that also include two goals from ace Duluth East forward and Mr. Hockey candidate Garrett Worth. The Skippers played that game without star defenseman Josh Luedtke, who was recovering from a broken collarbone.